To play or pause a file, press ( ). Press (∨) or (∧) to select the desired folder. To return to the first folder, press and hold (∨) until you hear a beep. When the desired folder is reached, press the switch once again. Turn the dial or press “∧” or “∨” on to select the desired file. When the desired file is reached, press once again. Press and hold “∧” or “∨” on . Press and hold (RAND) until you hear a beep. Press and hold (RPT) until you hear a beep. Each time the switch is pressed, the display changes in the order of Folder no./File no./Elapsed time→Folder name→File name→Album title (MP3 only)→Track title→Artist name. Press (RAND), (RPT) or again. “ERROR”: This indicates a trouble either in the CD or inside the player. The CD may be dirty, damaged or inserted up-side down. “NO MUSIC”: This indicates that the MP3/WMA file is not included in the CD. CDs may be damaged and may not play properly. There is a limit to the MP3 and WMA file standards and to the media/formats recorded by them that can be used. 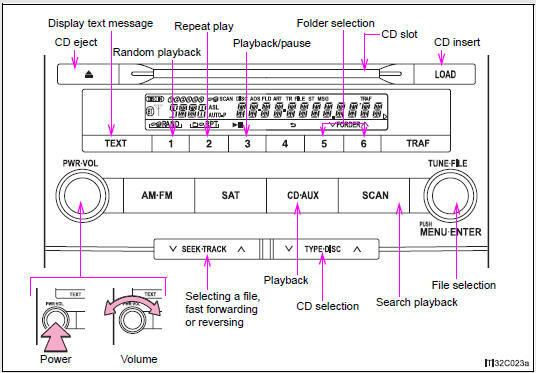 Media that can be used for MP3 and WMA playback are CD-Rs and CDRWs. Playback in some instances may not be possible, depending on the status of the CD-R or CD-RW. Playback may not be possible or the audio may jump if the disc is scratched or marked with fingerprints. File formats: ISO9660 Level 1, Level 2, (Romeo, Joliet) MP3 and WMA files written in any format other than those listed above may not play correctly, and their file names and folder names may not be displayed correctly. The only files that can be recognized as MP3/WMA and played are those with the extension .mp3 or .wma. As the audio system is compatible with multi-sessions, it is possible to play discs that contain MP3 and WMA files. However, only the first session can be played. ID3 tags can be added to MP3 files, making it possible to record the track title and artist name, etc. MP3 and WMA playback When a disc containing MP3 or WMA files is inserted, all files on the disc are first checked. Once the file check is finished, the first MP3 or WMA file is played. To make the file check finish more quickly, we recommend you do not write in any files other than MP3 or WMA files or create any unnecessary folders. If the discs contain a mixture of music data and MP3 or WMA format data, only music data can be played. If the file extensions .mp3 and .wma are used for files other than MP3 and WMA files, they will be mistakenly recognized and played as MP3 and WMA files. This may result in large amounts of interference and damage to the speakers. To play MP3 file with steady sound quality, we recommend a fixed bit rate of 128 kbps and a sampling frequency of 44.1 kHz. There is a wide variety of freeware and other encoding software for MP3 and WMA files on the market, and depending on the status of the encoding and the file format, poor sound quality or noise at the start of playback may result. In some cases, playback may not be possible at all. When files other than MP3 or WMA files are recorded on a disc, it may take more time to recognize the disc and in some cases, playback may not be possible at all. Microsoft, Windows, and Windows Media are the registered trademarks of Microsoft Corporation in the U.S. and other countries.